Dan Schmitt grew up in the greater Seattle area as one of two sons born to German parents who settled there in 1977 to start a medical practice. 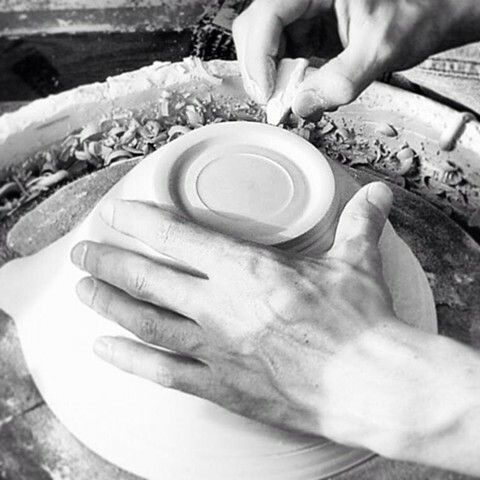 Originally going to college to study sports medicine Dan discovered ceramics at the University of Puget Sound under Ken Stevens and John McCuistion and went on to receive his MFA from Kent State University under Kirk Mangus in 1998. After graduate school he moved back to the Pacific Northwest and set up his studio in Eugene, Oregon, where he continues his art practice today. His work first gained national recognition when in 2000 he was commissioned by the Smithsonian’s Renwick Gallery to create a five piece place setting and tea service to be included in their survey of American Ceramics titled USA Clay which has since been placed on permanent display at the Smithsonian’s Luce Foundation Center for American Art. He has exhibited and sold his work across the country through galleries, craft shows, and exhibitions. From 2010 to 2012 Dan studied Product Design at the University of Oregon where he explored furniture making, lamp design, bicycle design, and various manufacturing processes. In addition to his studio practice Dan has taught at the University of Oregon (2007-2008) and at Lane Community College (2010-2016).